China King Chinese Buffet restaurant is a great place to go for lunch! Pile your plate high with classic Chinese dishes like crab rangoon, spring rolls, general tso's chicken, sweet and sour everything and don't forget the hot and sour soup man! You go behind main counter - You ask for duck sauce. 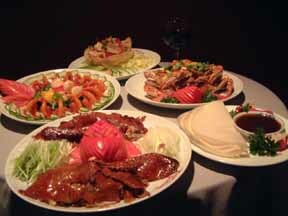 The New Peking Chinese restaurant is located in the Westport area of midtown Kansas City. The New Peking Chinese restaurant is NOT a chain-type Chinese buffet. The New Peking Chinese restaurant is not a buffet at all, in fact it is an authentic Chinese restaurant that serves a great lunch and dinner menu prepared by expert in-house chefs all in a large yet intimate restaurant. Incredibly affordable and equally delicious, this is one of our favorite DINE-IN Chinese restaurants. The New Peking Chinese restaurant hosts a full bar, several private rooms and one of the best restaurant staffs in the Kansas City area. The New Peking Chinese restaurant features all of your favorite Chinese foods plus a few original creations. The New Peking Chinese restaurant is very reasonably priced and the food is far above the other Chinese restaurants in Kansas City. They have a great lunch special daily from 11am - 2:30pm and they offer take out service and catering. All luncheon specials are served with crab rangoon, chicken wings, fried rice, and choice of Egg Drop Soup or Hot & Sour Soup. Wrapped with crispy spring roll skin and fried with cream cheese and large shrimp. Marinated Beef on a stick. Your choice of wings or boneless. Stir-fried beef cooked with our famous house sauce and served on a bed of cabbage. paper, served with peanut sauce. and fried to a crisp. Fish, shrimp, scallops and crab wrapped with fried tofu. Your choice of Korean or American style. Tempura, Chicken Wing and BBQ Ribs. Marinated chicken with vegetables served on a sizzling hot plate. vegetables, made two ways for those who can’t decide. Deep-fried, whole snapper topped with stir-fried vegetables. Peking-style sweet and sour sauce. Deep-fried red snapper served in a spicy Szechwan sauce. and mushroom sautéed in a ginger-garlic sauce. and cucumbers sautéed in a spicy, mustard sauce. Breaded, deep-fried chicken in a spicy Korean sauce. squid, beef, scallops and vegetables. Shrimp, scallop, squid and zucchini served in a plum sauce. with chicken, shrimp, beef and vegetables. Broad, flat noodles with chicken, beef, shrimp or a combination. Served dry stir-fried, with curry sauce or brown sauce. sauce, served on a bed of fresh cabbage. then deep-fried for a crispy outside. Your choice of breaded deep-fried or stir-fried. Crispy, bone-in duck with our savory sauce served on the side. Bean Sprouts and finally a light Duck Soup. vegetables, served tableside on a sizzling, hot plate. snow peas and water chestnuts stir-fried in a white sauce. Fresh, jumbo shrimp lightly fried with a garlic-ginger sauce. Diced chicken and shrimp stir-fried in Kung Pao sauce. yellow onion, zucchini, peanuts and chili pepper. shoots and sliced carrots in an egg white sauce. carrots and bean sprouts on fried noodles. A sweet ending covered with fudge, ice cream & sprinkles. Served with steamed rice and crab rangoon. The New Peking Chinese restaurant gladly accepts Visa, Mastercard and American Express. No checks, please. National Chinese Restaurant News – voted Best 100 Chinese Restaurants in US three years in a row! Bo Lings is named after creators Richard "Bo" Ng and Theresa "Far Ling" Ng. 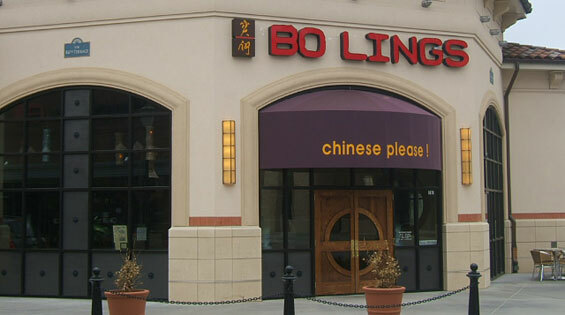 Bo Lings opened its doors in 1981 looking to raise the standard of Chinese dining in Kansas City. With a relaxed modern atmosphere, Bo Lings offers dishes from many Regions of China and Thailand, all homemade using the freshest, highest quality ingredients. Served with egg drop soup, crab Rangoon, and choice of steamed white, brown rice or vegetable fried rice. FYI: White or Brown rice are served with all entrees except Noodles, Rice, and Soups. Our white rice is a blend of Thai Jasmine and US Long Grain Rice for aroma and texture. All entrees are cooked to order and most do not contain MSG. The asterisk * denotes spicy dishes - All spicy dishes are cooked medium hot, unless requested differently. *Grill Chicken Satay (4) / (12) $6.25 regular $16.95 large Chicken breast, marinated in garlic, lemongrass and spices. Served with spicy peanut-coconut dipping sauce. Meat Dumplings (8) / (24) $5.95 regular $16.95 large (Order steamed or pan fired) Tender pork and fresh vegetables in hand-rolled wrappers. Served with soy-vinegar dopping sause. Barbecued Back Ribs (1/2) / (1) $9.25 regular $17.95 large Tender and delicious baby back ribs, slow roasted in our special hanging oven. Vegetable Spring Rolls (2) / (8) $3.55 regular $11.95 large Mushrooms, cabbage, celery, and bamboo shoots in a crispy wrapper. Spring Roll - Vietnamese Style (2) / (6) $4.25 regular $12.25 large Shrimp, pork, fresh cucumber, lettuce and cilantro with rice noodles rolled in streamed rice wrappers. Served with peanut dipping sauce. Shrimp Tempura (4) / (12) $6.35 regular $18.35 large Jumbo shrimp in a light batter. Served with crispy vegetables. Cantonese Lettuce Wrap (3) / (1extra) $5.95 regular $2.00 large Choose chicken or all vegetables. Black mushrooms and water chestnuts over crisy rice noodles in a fresh lettuce cup. Served with plim sauce. Crab Rangoons (6) / (18) $5.95 regular $16.25 large Cream Cheese & crab meat in a wonton wrapper. Crisy Eggplant $5.75 regular $9.75 large Fresh Chinese eggplant in a light batter with dipping sause. Egg Rolls (2) / (8) $3.55 regular $12.95 large Chicken, pork, cabbage and celery. *Hot and Sour Soup $2.55 cup $3.55 bowl $7.95 quart Pork, mushrooms, tofu and bamboo shoots. Very popular. Chicken Wonton Soup $2.45 cup $3.45 bowl $7.95 quart Chicken filled wonton in light broth with roasted pork and fresh vegetable. Sizzling Rice Soup with Chicken for Two $7.55 quart Sliced chicken, mushrooms, snow peas and crispy rice in broth. *House Special Whole Flounder $18.95 regular Whole boneless flounder in your choice of our famous sweet garlic-chili sauce or light ginger- scallion sauce. Our award winning dish. Cantonese Steamed Salmon Filet $13.95 regular Our #1 specialty. Fish in special soy sauce with fresh ginger and scallions. Served with steamed vegetables. *General Tso’s Chicken $10.75 regular $17.75 large Crispy chicken in a sweet and spicy sauce. Tso Tsung-tong was a regional leader of Sichuan Province during the late 18th century. Most popular dish. *Orange Peel Shrimp $13.95 regular $22.95 large Jumbo shrimp, fried, tossed with hot peppers, garlic, ginger and orange peels in delicious sauce. *Sichuan Hot Pepper Beef $11.95 regular $17.95 large Traditional Sichuan spicy dish. Tender beef, garlic, chili and peppercorn sauce with spinach, celery and scallions. HOT! *Gong Bao Shrimp and Scallops $13.95 regular $22.95 large Jumbo shrimp and tender scallop, with peanuts and hot peppers. Served with stir-fry fresh green beans. Pork Chop Cantonese $11.95 regular $17.95 large Pork tenderloin in light sweet ginger sauce. Try it if you like sweet and sour pork. *Spicy Shrimp and Pork Delight $12.95 regular $19.95 large Shrimp in garlic-chili sauce and pork in black bean sauce. Hainan Scallops $13.95 regular Tender scallops, fresh vegetables in a light ginger sauce. Beijing Roasted Duck (half) / (Whole) $15.75 regular $29.00 large Honey glazed top grade young duckling, hanging roasted in our special oven. It is famous for its crispy skin and tender meat. Served with cucumber, green onions and sweet duck sauce. Rolled together in a soft steamed hand-rolled pancake. It’s the best duck in town. Mandarin Chicken $9.75 regular $15.75 large Stir-fried tender chicken in hoisin sauce. Famous Bei Jing regional dish. *Gong Bao Chicken $9.75 regular $15.75 large Dried red peppers, tender diced chicken, and crunchy peanuts, tossed together in our 2000 degree wok. It is hot and spicy. Served with stir-fry green beans. *Sichuan Peppercorn Chicken $9.75 regular $15.75 large Sliced chicken in a spicy peppercorn, and chili sauce. Served with stir-fry vegetable. *Spicy Curry Chicken $9.75 regular $15.75 large Our special blend of curry and herbs, tender chicken, fresh vegetables and coconut milk. *Empress Chicken $9.75 regular $15.75 large Batter-fried chicken, broccoli and water chestnuts in a light, sweet, chili sauce. *Chicken with Black Bean Sauce $9.75 regular $15.75 large Aromtic black beans and garlic. Delicious Cantonese dish. Moo Shu Chicken $8.95 regular $14.95 large Sliced chicken, cabbage, mushrooms, eggs, scallions and noodles, all rolled in soft handrolled pancakes. Served with hoisin sauce. Sizzling Steak and Shrimp $13.95 regular $19.95 large Beef Tenderloin and shrimp in black pepper sauce. House Special Sizzling Rice $13.95 regular $19.95 large Shrimp, scallops and chicken with fresh vegetables in light ginger sauce. Served on crispy rice. Sizzling Shrimp and Scallops $13.95 regular $19.95 large Tender Scallops and Gulf shrimp with onions, mushrooms and snow peas. Honey Walnut Crispy Shrimp $12.95 regular $18.95 large Crispy fried shrimp n special honey and mayonnaise sauce. *Chicken and Shrimp Hunan Style $11.95 regular $18.95 large Shrimp, chicken, mushrooms, snow peas and ed bell peppers in spicy chili sauce with garlic and onions. * Beijing Shrimp $11.95 regular $18.95 large Battered fried shrimp in a flavorful wine sauce (mix of ginger, garlic, chili with a light touch of sugar and vinegar). Mandarin Pork $9.55 regular $15.55 large Tender pork strips in delicious hoisin sauce. Twice Cooked Pork $9.55 regular $15.55 large Steamed and stir-fried pork with bell peppers and green onions in a spicy hoisin sauce. Moo Shu Pork $9.55 regular $15.55 large Strip pork, cabbage, mushrooms, eggs, scallions and noodles, all rolled in soft hand-rolled pancakes. Served with hoisin sauce. *Spicy Mongolian Beef $9.95 regular $15.95 large Sliced beef with green onions in spicy sauce. Served on a bed of rice noodles. *Yu Hsiang Beef $9.75 regular $15.75 large Sichuan garlic beef with water chestnuts and bell peppers. *Fresh Green Beans Sichuan Style $8.55 regular $14.55 large Tender fresh green beans with fresh garlic and ginger in light soy sauce and chili. Simple dish complex flavors. Our best selling vegetable dish. *Vegetables in Curry Sauce $8.95 regular $14.75 large Fresh seasonal vegetables in our special blended spicy curry sauce. Sautéed Mixed Vegetables $8.55 regular $14.55 large Fresh seasonal vegetables with touch of ginger, garlic and green onions. *Szechuan Eggplant & Tomato $8.75 regular $14.75 large Tender Chinese purple eggplant and roasted tomatoes with garlic, ginger and our special chili sauce. Tofu with Black Bean and Garlic Sauce $8.55 regular $14.55 large Tofu, bell peppers and scallions in savory Cantonese Garlic and back bean sauce. Tofu Family Style $8.55 regular $14.55 large Tofu, bell peppers, mushrooms and onions in spicy brown sauce. Bo Ling Fried Noodles $10.75 regular $15.95 large Pan fried lo mein noodles with shrimp, beef, chicken and vegetables in brown sauce. Beef or Chicken Chow Fun $9.55 regular $15.55 large Soft flat rice noodles and tender beef with bean sprouts and onions. 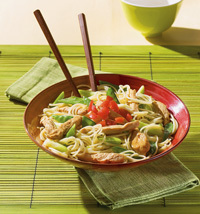 Cantonese Noodles with Chicken $9.55 regular $15.25 large Thin crispy noodles with tender chicken and fresh vegetables. *Singapore Style Noodles with Curry $9.75 regular $15.75 large Shrimp, roasted pork, onions, eggs, and bean sprouts sautéed with thin rice nooldles and mild curry. Long Life Noodle Soup $8.95 regular $14.95 large Shrimp, chicken, egg and fresh spinach in chicken broth. House Special Rice Plate $9.75 regular $15.75 large Fried rice topped with shrimp, scallops and chicken in brown sauce. Fresh Vegetables Fried Rice $7.95 regular $12.95 large Zucchini, mushrooms, snow peas, carrots and bean sprouts. Young Chow Fried Rice $8.95 regular $14.95 large Combination fried rice with shrimp, chicken and BBQ pork. Fresh, contemporary and consistently outstanding are the trademarks of P.F. Chang's China Bistro. Founded in 1993, P.F. 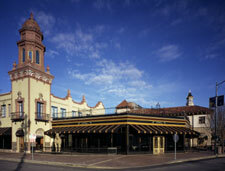 Chang's is a restaurant that has been embraced by diners across the country. The P.F. Chang's experience is a unique combination of Chinese cuisine, attentive service, wine, and tempting desserts all served in a stylish, high-energy bistro. At P.F. Chang's we are committed to providing our guests with an exceptional dining experience every time they walk through our doors. Whether creating custom sauces tableside, guiding guests through the menu or suggesting dishes to enhance your meal, our friendly, knowledgeable service staff and attention to detail are a winning combination. The goal of a P.F. Chang's meal is to attain harmony of taste, texture, color and aroma by balancing the Chinese principles of fan and t'sai. Fan foods include rice, noodles, grains and dumplings, while vegetables, meat, poultry, and seafood are t'sai foods. P.F. Chang's cuisine is reflective of China's evolving culinary landscape. The menu features traditional Chinese offerings and innovative dishes that illustrate the emerging influence of Southeast Asia on modern Chinese cuisine. Our chefs are respectful of the culture and traditions that are behind the dishes they prepare. Working in a dramatic exhibition kitchen, they use Mandarin style wok cooking to prepare the dynamic menu. Using only the freshest, highest quality ingredients, our chefs create lightly sauced dishes that allow natural flavors to emerge and stimulate the senses. Chicken, bean curd, bamboo shoots and wood ear mushrooms, sparked with hot white pepper and vinegar. Mushrooms, chicken, shrimp, and pork wontons in a chicken broth. Pork dumplings, shrimp, green onions and bean sprouts in a spicy chicken broth. STEAMED "FISH OF THE DAY"
Lunch served daily until 4 p.m.
Stir-fried with bell peppers, onions and mushrooms in a garlic soy sauce. Served Cantonese-style, tossed with fresh steamed broccoli. Lightly battered and quick-fried with a flavorful sauce. Thin noodles grilled then stir-fried with a choice of beef, chicken, pork or shrimp. 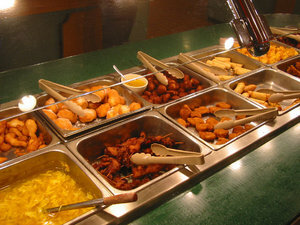 China Star Chinese buffet is a great place to grab an all you can eat Chinese feast! Super friendly staff and a large variety of Chinese food makes China Star Chinese buffet one of our favorite Sunday afternoon stops. 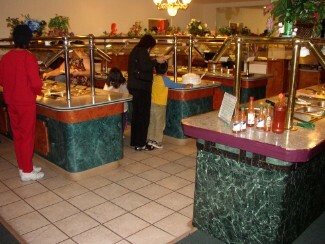 The China Star Chinese Buffet keeps their food fresh and constantly refills the hot trays of Chinese goodness. From classic Chinese food dishes to some new creations, The China Star Chinese Buffet is what Chinese food is all about - and LOTS of it! Eat up Chinese chung chow! The Happy Dragon has some of the best quality Chinese food in Kansas City. The Happy Dragon is located just across the Missouri/Kansas state line and easily delivers to either Kansas City, Missouri or Overland Park and Leawood Kansas. Their delivery time is UNBELIEVABLE!! Seriously though, these guys are the fastest delivery team I have ever seen. I'm not making this up - I literally hung up the phone after making my order and counted an astounding 8 minutes until the knock at my door came with my food. The food at The Happy Dragon by far surpasses the quality of other local Chinese Restaurants. They feature an eat-in buffet as well as a full menu and once again, the fastest delivery guys in the midwest. If you're sitting in your hotel room and don't want to wait long for some great Chinese treats, by all means pick up the phone and call The Happy Dragon. We order delivery from them about 2 times a week. Perfect for that lazy Sunday lunch during football! You May Order by phone for super - delivery from this menu! an assorted tray of our finest appetizers, fantail shrimp, spare ribs, cho cho beef, crab rangoon, chicken wing & spring roll. 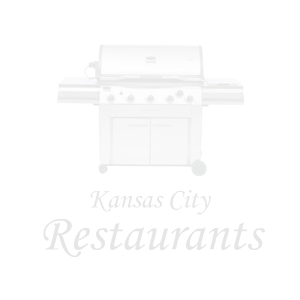 Coupon - Tell Them Where You Found Them at www.restaurantkansascity.com !! lightly batter broccoli & fried in special red hot sauce. chunk chicken sauteed in orange flavored sauce. chunks of chicken sauteed w. special hot sauce. chunks of chicken sauteed w. sesame seeds in special sauce mild & delicate. chicken, pork & shrimp battered then deep fried served w. sweet & sour sauce. diced chicken, beef & shrimp sauteed w. waterchestnuts, celery, broccoli steams, green pepper in highly seasoned hot pepper sauce. sliced chicken, beef & shrimp sauteed w. snow peas, carrots, waterchestnuts, mushrooms, bamboo, broccoli & napa in brown sauce. shrimp & scallops sauteed w. ear mushrooms, waterchestnuts, broccoli, bamboo yellow onions, carrots & green pepper in hot garlic sauce. slices of tender beef sauteed w. orange flavored spicy sauce. sliced beef & scallops sauteed w. waterchestnuts, mushrooms, snow peas, bamboo shoots, napa, carrots, baby corns & broccoli in brown sauce. fish fillets served w. special hot sauce. shrimp, scallops, crabmeat sauteed w. broccoli, bamboo, mushrooms, napa, baby corns, mushrooms, waterchestnuts, carrots & snow peas in white sauce w. hot plate. pan fried soft noodle topped w. beef, chicken & shrimp w. veg. in brown sauce. shrimp, scallops sauteed w. waterchestnuts, celery, zucchini, broccoli stems, green pepper in highly seasoned hot pepper sauce. combination of shrimp, scallops, chicken, pork beef & crabmeat sauteed w. snow peas, carrots, waterchestnuts, mushrooms, bamboo & broccoli, baby corns in brown sauce. served w. hot plate. whole lobster tail cut into chunks sauteed w. waterchestnuts, sliced carrots, ear mushrooms, bamboo, mushroom, broccoli served in a hot grlic sauce. whole lobster tail cut into chunks sauteed w. onions in hot spicy tomato sauce. (for 2 people) two different food in one plate, one side is the lobster mandarin, the other side is general tso's chicken. China King Chinese Buffet restaurant is a great place to go for lunch! Pile your plate high with classic Chinese dishes like crab rangoon, spring rolls, general tso's chicken, sweet and sour everything and don't forget the hot and sour soup man!